The bedraggled creature on the right.. 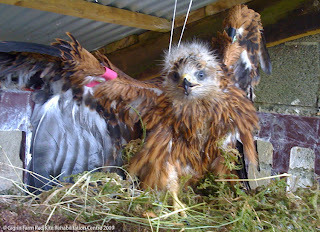 The bedraggled creature in the right image is the same red kite chick that was so fiery only the day before. I'd come into the aviary to check on the birds and found the numpty sitting in the only puddle in the entire enclosure. On being reunited with the covered perch it made a very sorry picture but I'm happy to report the bird now has dry feathers again, and is eating all its rations. The kite chick that was brought in last week is no longer here. Having had a series of good meals it was once again deemed to be fit enough to return to the nest from where it had been rescued. 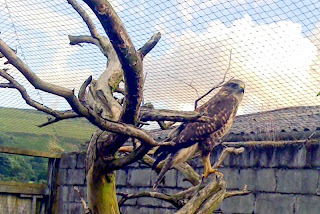 The young buzzard is fit and well, and feeding itself. It is far too independent to expect it to stay with new parents, so will instead stay here until it can be released as a young adult. 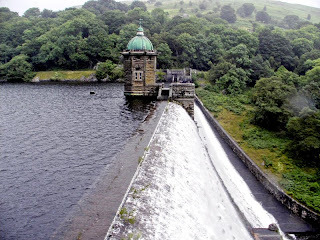 I escaped for a short while this morning to take a ride around the Elan Valley as with the rain that has fallen of late the dams had filled to the brim so were an amazing sight with water cascading over the stone faces. This is not something to be expected in the summer and in June they were some 20ft below the normal level. The 4 day Royal Welsh Show begins tomorrow - just 13 miles south of Gigrin. It is the largest show of its kind in the UK following the demise of the Royal Show. Roads will be busy near the show but diversions will be in place for those not wishing to go there. The numbers of red kites we are currently feeding are far greater than has been the norm for summer months so the spectacle is far greater than has ever been seen on TV. 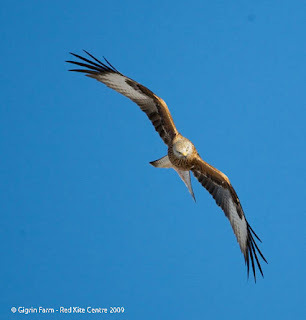 This could be the the way things go each year now as red kites in Wales now exceed an estimated 900 pairs! 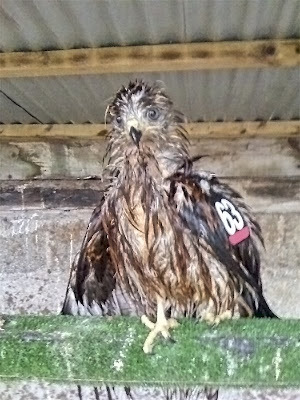 All had been quiet in the rehabilitation aviaries since the red kite chicks went to Ireland last month but all of a sudden a flurry of action has come our way. This red kite chick, showing off as I approached with food this afternoon, was the first to arrive. Its parent had been found dead, with signs of secondary poisoning - rat poison being thought the most likely culprit. Red Kites, being opportunists will, happily take slow moving rodents, sometimes with dire consequences. Yesterday, I went up to the aviaries and found Tony Cross had arrived with more rehab patients - one very under nourished adult red kite, and a young buzzard which had had an altercation with a moving vehicle. And, this evening another red kite chick was brought in by a vet from some 11 miles away. Rabbit and grey squirrel are on the menu for these birds. I will keep this page updated with developments. Despite having had some of the hottest days so far this summer the kites are still coming in first for the food. Other years a wait of upwards of an hour could be expected as the birds took advantage of the free ride provided by thermals and would wait for crows to alight on the food before slowly sinking back down but, the spectacle provided by the kites plunging down for food just feet away from the hides has continued without interruption so far. Some 200 or more are currently coming in for lunch. The ITV Country Wise programme has done wonders for the locality in alerting many more folk to the beauty of this part of Wales. The effect has also been felt here with many more visitors than normal for the time of year. Labels: red kite rehabilitation, red kites.